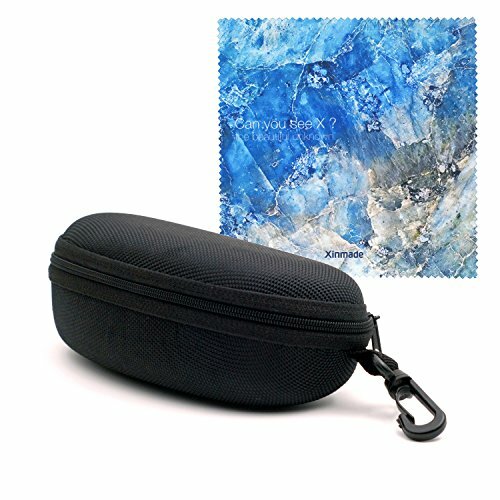 XINMADE Eyeglass Case with Zipper & Clip is a durable sporty sunglass case that can attach to your belt loop or backpack. It is made of EVA foam, which is very lightweight, only 2 OZ. and durable, easy to carry around and great for outdoors and sports. It is suitable for medium and large size sunglasses. The package come up with a free high quality Synthetic Suede Cleaning Cloth, we hope you will like it. - OUTSIDE DIMENSIONS: Length 6.6" x Width 3" x Height 2.7"
- INSIDE DIMENSIONS: Length 6.4" x Width 2,2" x Height 2"
XINPORT, we based in US, Sweden and China, collecting products with good quality and reasonable price around the world. We believe in our products. That's why we offer an life time warranty, including customer satisfied return and change policy, with a 100% Money Back Guarantee. CLICK the yellow button 'Add to Cart' in the top right corner, you will find a lot more joy to own it. Lightweight and durable EVA foam, only 2 OZ. If you have any questions about this product by XINMADE, contact us by completing and submitting the form below. If you are looking for a specif part number, please include it with your message.